It may be a little late to order this beast for your Memorial Day barbecue later this evening, but it is still a great addition to any grill hound's arsenal. The smoker provides less direct heat to the meats on the top racks. 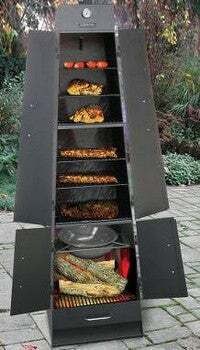 This BBQ tower has six different racks for meat and two racks underneath for the fire and any smoking flavoring. If I didn't live in a tiny apartment I would be all over something like this. It is a hell of a lot better than my George Foreman or tiny Weber grill. $500.